Pestos are great because they can be used in many dishes, and there’s no cooking involved. This saves you more than just time: with no cooking, you’re getting all the nutrients with nothing lost through any part of the preparation process. 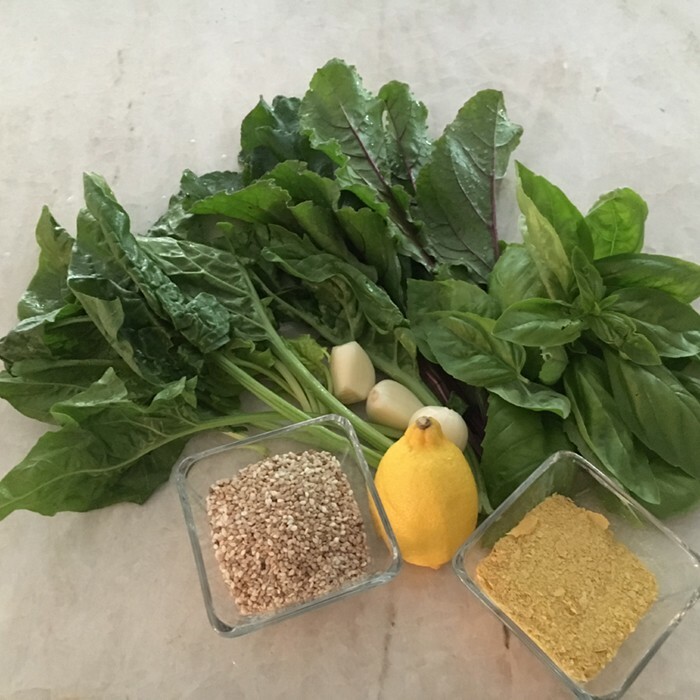 Wash and pat dry the basil, spinach and beet greens. Add washed greens to food processor, and pulse until coarsely chopped. Add sesame seeds, garlic, lemon juice and nutritional yeast. Continue to pulse, drizzling in the olive oil. Once completely mixed, add salt and pepper to taste. If needed for your taste buds, you can add more lemon juice, olive oil, or nutritional yeast for a "cheesier" taste (or real parmesan if you can eat dairy) to achieve what you like best. This pesto is one way to incorporate beet greens into your diet without even tasting them. Beet greens carry more nutrients then the actual purple-red root we know as "beets." They're standout sources of vitamin C, iron and calcium, to name just a few health benefits. This pesto tastes great on a bruschetta, pizza, and of course, on your pasta of choice. And you can use it as a garnish on any dish. Remember that pesto freezes well, so make a large batch and save any leftovers.